Tower's Anti-Aging Technology drink mix is an orthomolecular formula designed to promote increased production of human growth hormone (HGH) by the pituitary gland. The ingredients were selected based on the published recommendations of anti-aging specialist Ronald Klatz, M.D., as contained in his book, Grow Young With HGH. Tower's powdered drink mix formula combines the equivalent of 30 vitamin and amino acid pills into 2 teaspoons! One serving mixed with water makes a palatable, life-extending drink. 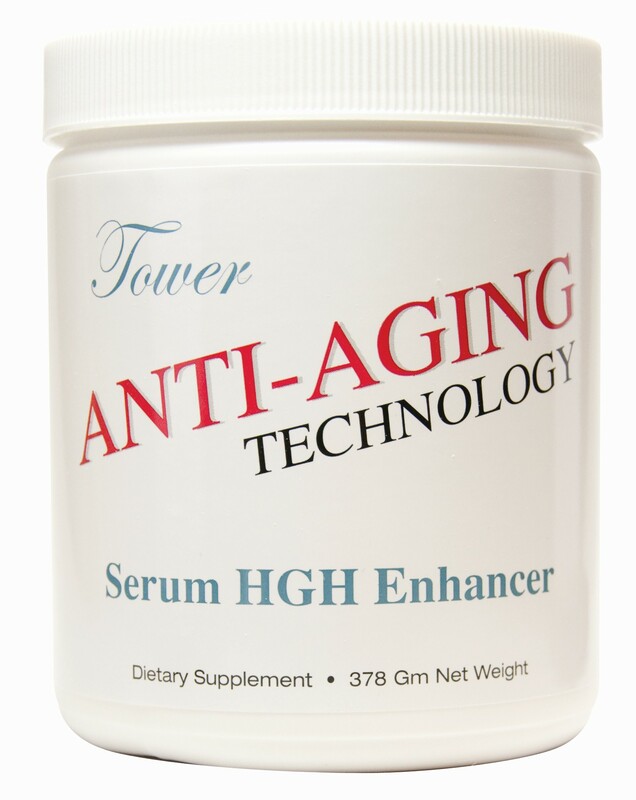 Anti-Aging Technology features 3,000 mg of the amino acid arginine, which has been uniquely combined with high-dose lysine. Clinical studies show that arginine and lysine together may significantly boost the body's natural HGH synthesis over that which either amino acid may stimulate by itself. High doses of arginine stimulate HGH in most people. In fact, 14 grams of this amino acid are used in the medical test that determines whether the pituitary is able to produce its own HGH. Tower's scientists created the first high-arginine drink mix with a palatable taste in the form of Anti-Aging Technology by combining arginine with lysine. Arginine has a very poor taste, and historically anti-aging supplements that include arginine require many pills or capsules. This novel drink mix approach makes Tower's HGH secretion formula much easier to swallow than 30 or more pills, the form that arginine is usually found in. Anti-Aging Technology still works as a partial Lp(a) binding inhibitor but does not contain proline. It can be used for longer-term Pauling therapy maintenance after HeartTech or Ascorsine-9. When taken together, Tower recommends taking HeartTech or Ascorsine-9 with breakfast and lunch and Anti-Aging Technology with dinner and before bed. Drink mix. No pills. Just add water. Compare as separate pills! Convenient home delivery at wholesale. No fillers, glues, binders, additives or particulate. Contains the minimum Pauling protocol. Can be used for longer term Pauling therapy maintenance after HeartTech or Ascorsine-9 or simultaneously with any of our other formulas.